AiryLab’s Genika Astro is an image acquisition software dedicated to astronomical imaging. It supports high-speed cameras, including those from Andor, AVT, Basler, IDS, PointGrey, Raptor Photonics, Celestron, The Imaging Source and ZWO. The company has announced two recent releases that significantly augment the functionality of the software. Genika Astro offers enhanced performance for direct image-to-disk recording. It can sustain more than 400MB/s throughput for long periods of time – the only limit being the disk capacity. It uses the advanced data management of its sister application, Genika Trigger, to minimize the frame loss – or even eliminate it – by using the FIFO dynamic buffering and two leaky-bucket algorithms. Stringent timing requirements are covered either using GPS resynchronization, for a precision better than 10ms, or using the optional UTC Timebox that controls the camera shutter directly for a sub millisecond precision. Designed for both professional and enthusiast astronomers, it brings a unique feature set that covers all applications for short exposure imaging, including (1) highspeed image recording for imaging of planets, the Moon and Sun and star occultations by asteroids with support of low-noise EMCCD cameras, (2) mutual phenomena between the moons of the giant planets for photometric analysis, (3) any image acquisition that requires a high precision timestamping, (4) automated high-resolution solar acquisition when used with Airy Lab’s Solar Scintillation Monitor, and (5) image acquisition based upon an external trigger. 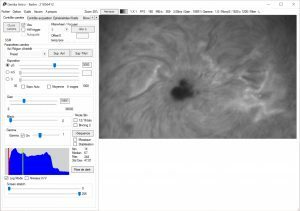 With the release of Genika 2.13, Airy Lab has introduced a new scoring for the focus of the video stream with a low sensitivity to turbulence – providing real autofocus implemented in a high-speed astronomy acquisition software. It can be used manually to achieve target image sharpness values or more precise real autofocus when an absolute ASCOM focuser is connected (in which Genika tests the sharpness across the focus range and performs a Gaussian fit to determine the best focus position). This method is very accurate, even with turbulence and high digital sampling. With Genika 2.13.2.0, it is possible to integrate your own image processing library. Genika can call two external DLL files – one for images to be displayed and the other for all images acquired. Two Visual Studio 2015 C# templates, with examples, are provided. Those DLL files are instanciated and you can use you own windows, methods, members and threads. You can return to Genika a modified image, and/or just copy it to make you own processing using any language and any image processing library. You can learn more at www.airylab.com.